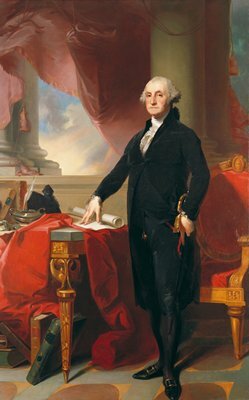 Gilbert Stuart painted many portraits of Washington—including the original of this image—but claimed the one in the White House was not his (the White House still says it is). Today, while many artists would love to be linked to a work by Peter Doig, whose paintings of mystical landscapes sell for tens of millions of dollars, one artist has denied the attribution: Peter Doig. He’s being sued by the owner of a painting who would like to cash in on it—but can’t if Doig continues to disown it. It certainly looks like his work, was purchased 40 years ago from an artist who resembles Doig. But Doig says it wasn’t him—and now, to avoid $5 million in damages, he has to prove it. Image: The disputed painting, as it appeared in the New York Times on July 7, 2016.